If you don't believe this, read "Against the Gods", "How we decide", or "The irrational economist". Rather than make the trains run on time, it may be more beneficial to do away with trains! Efficiency is a matter of getting the most outcome for the least effort. Effectiveness is getting valuable outcome for every effort applied. Value-add is effectiveness achieved efficiently! Greg Githens has a post on programs and projects that has a nice comparison of the mindset and objectives that go with each. He says project objectives are tactical and program objectives are strategic: Well, it depends on the project doesn't it? An ERP project is certainly a tactical achievement, but it's often justified on its contribution to strategic business performance and capabilities, especially capabilities directed to customers. Projects regard “risk” as a threat that will undermine performance. Project mangers focus on reducing uncertainty. Programs regard “risk” as an opportunity that brings with it threats and obstacles that will be managed. Program managers focus first on managing ambiguity and then on managing uncertainty. Projects are typically led by people who have good knowledge of the technology and system. Programs are typically led by people who appreciate the politics and culture as well as the technology. Stated differently, they tend to function more as executives than as technocrats. Earned value management [EVM] reform is in the air--actually, it's been in the air for some time with effort in Congress to correct some of the problems, as reported by Glen Alleman and Paul Solomon. In the Nov/Dec 10 online edition of the magazine Defense AT&L, Paul Solomon reports on initiatives to close three big gaps in the ANSI-EIA 748 standard on earned value in an article entitled "Earned Value Management Acquisition Reform"
Quality gap: There is no explicit provision to measure quality achievement--or short comings--in the formulation of a claim for earned value by a cost account or work package manager. Technical performance gap: Although all technical projects have some kind of a technical performance objective and most have some sort of time-phased technical performance achievement plan, again the EVM system is not required to take achievement objectives into account explicitly. Solomon believes that the fact that '748 is work oriented [work: the schedule] and not also product oriented [product: the WBS] leaves both quality and TPM--these more generally associated with product than work--in the shadows. Risk management gap: Solomon says this: "The 32 guidelines in ANSI/EIA-748 fail to address the integration of risk management with EVM". Among others, the standard provides no guidance for risk-adjusting EVM's linear equations used to calculate forecasts. Here's the other problems, according to information quoted by Solomon: "DoD has reported that EVM, based on the earned value management standard, no longer serves its purpose", and about that standard, Solomon says: "EVM is still recognized as an international, commercial best practice, but ANSI/EIA-748 has been largely ignored by commercial companies. When there is no government mandate to use EVM, the Project Management Institute (PMI) Guide to the Project Management Body of Knowledge (PMBOK® Guide) is a widely used standard for project management." Well, the PMBOK® Guide may be the go-to for non-Defense projects that employ EVM, but it's been my experience of two decades using EVM in DoD programs and then more than a decade in commerical IT that few non-Defense projects use any version of EVM, especially backoffice IT projects. And it's not because there's no government mandate. But if they want EVM, and if they went to the PMBOK® Guide, they'll find it's a subset of '748 that simply leaves out some of the process and reporting that weighs down '748. Solomon asserts that the PMBOK® Guide has started down the road to integrate risk, TPM, and quality with EVM. In spite of what Paul says in the article and on his website, neither the PMBOK® Guide or the companion PMI Practice Standard for Earned Value Management directly address the three gaps. The fact that TPM, Risk Management, and Quality are all addressed under the same cover, and TPM appears as a practice in Quality Management and Risk Management does not integrate these practices with EVM. Indeed, in Chapter 7 on cost management where the PMBOK® Guide discusses EVM--an improvement over its earlier positioning as a communications tool buried in Chapter 10--the PMBOK® Guide says the measure of earned value is based on work completed. There is not a hint that product quality and performance should be considered. To be sure, in Chapter 8, work performance and quality are tied together, but it's a reach to then tie that connection to Chapter 7. And, although there are dotted planning lines from 'cost' to 'quality' knowledge areas, there are no such to risk management. In short, the PMBOK® Guide is not currently the answer to the three big gaps. When I do DoD programs, I set up a performance review board to evaluate and approve claims of EV from the WP and CA managers. It's the job of the board to hold the EV claimants accountable for TPM, quality, and risk. Done right, the standard can work. If you're interested in seeing what these documents might mean to your project if adopted, you can get copies at an interesting site: "pdf search engine.com"
Since it's November, I'll return one more time to the November Harvard Business Review that has an interesting set of articles on military leadership. Where there are highly integrated complex systems for which consequences are difficult to predict or control if managers and do'ers go "off book", process is king. Everything is 'by the book'. Where there are close encounters in local situation with local tools and capabilities, more or less self contained, then agile, evolutionary, and even emergent responses may be the best approach, indeed the required approach. The Air Force and the Navy more often encounter the former: in general their officers highly value process; the Army and Marine Corps are more often in the the latter situation with 'boots on the ground', and they value personal initiative and local maneuver. I was doing some research on my class in risk management and I happened upon a post by Bernie Thompson on Barry Boehm's spiral model that had a new twist [no pun intended]. 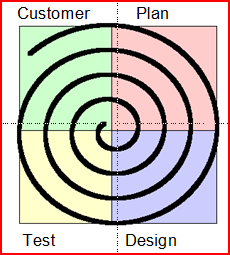 It's a take off on agile, lean, Deming's PDCA, and Boehm's spiral. You enter the spiral from the top left and go clockwise. Obviously, you have to pass by the customer after every test....presumably this really means pass by the customer after every tested object is ready for customer application, evaluation, or go-live. In any event, this diagram nicely captures the agile of idea of customer envolvement and a somewhat evolutionary outcome. 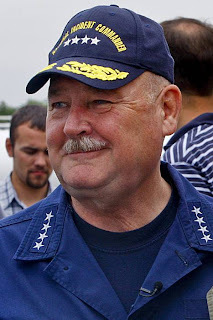 In the November 2010 issue of the Harvard Business Review, there is an interview with Admiral Thad Allen, the recently retired Coast Guard commandant and the "National Incident Commander" for the Gulf oil spill. Entitled "You have to lead from everywhere", it's a good read for those interested in how an experienced manager with a proven track record approaches different situations under different degrees of urgency and stress. 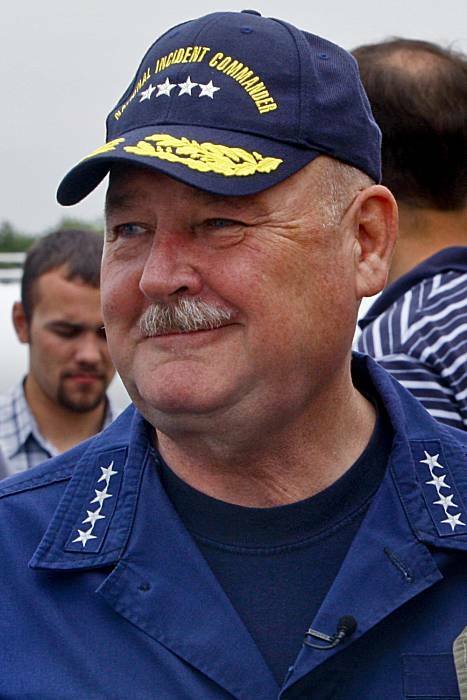 Interviewer Scott Berinato took the title from a reply Allen made to the question: "In a major crises...do you think it's more important to lead from the front or from the back? ", to which Allen replied: "You have to lead from everywhere". Here's the point that struck me: Allen says he approaches every assignment with a number of different mental models of how command might be exercised....Allen is an admirer of Peter Senge, noted MIT advocate of mental models....and may change models as events unfold. In many situations he has faced, he states that the chain of command model simply doesn't exist! OMG! No chain of command?! What he's saying is that in some situations there is no single manager is in charge. OMG! No one in charge?! But, Allen can work this way and make it effective. He calls for "unity of effort" rather than "unity of command"
In what I would call a “whole of government response”—to a hurricane, an oil spill, no matter what it is—that chain of command doesn’t exist. You have to aggregate everybody’s capabilities to achieve a single purpose, taking into account the fact that they have distinct authorities and responsibilities. That’s creating unity of effort rather than unity of command, and it’s a much more complex management challenge. So, what's the program management lesson here? Well, of course, the lesson is right in the word 'program' that implies multiple projects ostensibly working toward a common objective. And, of course, the objective may change, forced by unforeseen events. And if some of the effort is in the government, and some is in contractors and NGO's, and even within the government there are state and federal, or USA and ROW, there's a lot to be learned by studying the methods Allen has championed. - Locals do not value risk management at the same level. - Stakeholders tendency to be more risk-takers. Unfortunately, this is not an uncommon refrain. In fact, the tension between stakeholders and the project team arises from different biases, different anchor points, and different metrics to which they are held accountable. I had a recent post on attributes to look for in a Project Executive. Now comes Mike Clayton with a nice list of 15 ideas about "how do I become a project manager?" I like the list because for the most part it's all about taking personal initiative to get involved, get informed, and get educated. There are 14 more where this came from. Give it a read. It's extraordinary to learn how many projects and project managers are engaged in public service and voluntary efforts, lending the project skills they "get" from their paid work to effort they "give" away. It's been recently estimated that more than 63 million Americans are actively engaged in volunteer work...that's a blessing of our demographic metric of 330M citizens...and a fair number of them are engaged in real projects....as different from day-to-day volunteer operations. And the projects are everything from building houses to putting in water systems to putting up food banks. If you're looking for a "life", volunteering your PM skills may be the way! What, might you ask, does a dispute between Georgia, the Cherokee Indians, and the Chief Justice Marshall have to do with project management? It's a matter of federalism: is the PM--as the central authority--still relevant? Jackson was an union agilist....at least when he took office. POTUS Jackson originally thought Marshall's reasoning was wrong and the states should be able to decide for themselves which federal statutes to follow, but within a few months Jackson reversed himself. In the project context, this comes to the fore when agile methods are introduced that challenge the role of the PM [playing the part of USA] and agile teams [playing the part of states]. And, the question at hand is: What decisions and directions of the PM--specifically those for which the authorities are not enumerated in the project charter--are to be followed by the teams, and by what means does the PM 'enforce' decisions? Even if you diss the conventional 'command and control' ideas of the PMBOK, unless you are a one-team project, all teams are--or should be--'federated' under the leadership of the PM. The PM has the responsibility--and retains the responsibility--to set standards, values, and doctrine; to establish strategic direction; and to evaluate and give credit for earned value, leaving tactics to the agile teams. Indeed, the strategic-tactical tension is the strength of agile methods: those who are closest to the problem devine and execute the means to do things; but those closest to the intent of the enterprise set the strategy and the standards, and evaluate progress. When things go off track, it's the PM that directs recovery. In our world, evangelizing the wonders of the project and waxing eloquent about its advantages and disadvantages is the poetry of the visionary. Project managers grind it out with 'prose': the day to day plans, documents, and metrics of management! Here we are back with Mr John Nash and his equilibrium, called conveniently enough: the "Nash Equilibrium". If you missed Part I, you can get it here. Today, we take a look at what Alan Blinder did to move it along. Our spin is on project management, different from what Nash and Blinder used as the context, but nevertheless, the Nash Equilibrium shows up in project situations more often than we might imagine. Equilibrium refers to the idea that the game ends with everyone winning something, or no one losing everything. In other words, a state of balance exists between the parties when the game ends. Thus, equilibrium applies to non-zero-sum outcomes. Just to review Part I of this series: the Nash Equilibrium comes out of 'game theory' that is itself a study of how wary adversaries interact....most often in non-zero-sum situations in which they find themselves mutually involved. It is presumed that there is a sequence of moves by the parties in accordance with some protocol. Game theory is somewhat related to the more familiar 'utility theory' that describes how one or more persons' attitude is affected by the persons' relationship to [an inanimate] condition, risk, or event. The setup: Two parties face a situation. A resolution is needed. Each makes decisions independently. Each has similar tools and capabilities and preferences for an outcome, but they weigh each differently. What's most important to one is not so important to the other. And each has a pretty good idea of the other's priorities, tools, and capabilities. For the project game, let's assume that both cost and time are of importance to both the project team and to the stakeholder community, but each sets a different priority. We'll assume scope is constant. In the first figure below, we see a partially completed "Blinder Matrix". Stakeholder preferences are in the upper side triangle of each square. You can see that there are four combinations of two preferences between two parties. "cost/cost; cost/time; time/cost; and time/time"
We see that the stakeholders most favored preference is time and it is given the number 1 to indicate it's first rank. Cost is the least favored preference by the stakeholders [after all, project cost usually doesn't show up on stakeholder P&L]. Now, let's fill in the project preferences. In this 'game', project preferences are opposite the stakeholders; the PM values cost first. So, with the preferences established, let's play the game. Each party knows the other's preferences and thinks they know the other's strategy to react to the other's move. Each party is independent; each party is not looking for an optimum solution; they are looking for a stable solution that they can both live with. The next figure shows the strategy reactions by preference. For example, the upper right square, time/cost, is second rank for project after its first ranked preference time/time because at least the project is still focused on time. The project's third ranked preference is cost/time; the time 'agenda' is shifted to the stakeholder but that's better for the project than cost/cost that has no time preference. Let's say the stakeholder decides to make the first move: if the stakeholder chooses Time as their first move, then the project is not going to respond with time since a time/time situation ranks 4 for the PM; if the stakeholders goes with Cost, then the project will jump on that and the upper square situation will result with everyone lined up on cost; this ranks 4 with the stakeholders so stakeholders won't start with cost. Now, here's the equilibrium: there's no way to reach the upper right square with the stakeholder making the first move with Time. The stakeholder will go first with their higher preference, Time, along the lower row. If PM responds with time, then the game is an unstable 1/4 state; but we expect the PM will respond with their higher preference, Cost, and the game equalizes on the time/cost 3/3 square in the lower left, which is 3rd preference--a clear sub-optimization--but nevertheless stable!